Some buildings are so important that they have their own managers. Gabi O’Grady manages the Straughn Center for the University of Florida. She’s also a member of the Community Service Committee, and she holds a Master’s degree in Management. Gabi is responsible for everything that happens with the walls of Straughn IFAS Extension Center — a special-events venue on UF’s campus. Kevin: What do you do as the manager of the Straughn Center? Gabi: On the average day, most of what I do is either related to booking events or facility maintenance. On the events side, I solicit clients, host site tours, draw up floor plans with vendors and clients, and write contracts. On the maintenance side, I schedule cleanings, set up repair crews, and handle the logistics of facility maintenance. Gabi told me that she loves working with so many different groups and that she hates having to turn people down. Gabi: I get so many phone calls from groups desperate for a venue. When coordinating an event, always book your venue first! You can’t have an event without a place to host it. Kevin: What is the best work story you can tell me? Gabi: Most of my events take place during a standard workday, but at least once a week we have a group that meets in the evening outside standard business hours. After an event ends, I usually swing by the facility to make sure audio/visual equipment is turned off and the building is secure. When I threw the bag of trash I was carrying into the dumpster, my car and building keys went with it. I had left my cell phone in the building and the building was locked. I was completely stranded without my keys, so I went dumpster diving. It took 20 minutes of sorting through garbage in the dark to find my keys. I now wear my keys around my neck on a lanyard. In addition to appropriate lanyard use, Gabi advised that professionals must always be kind and treat people well. Gabi: The world is a small place and you never know where you are going to run into someone again, personally or professionally! 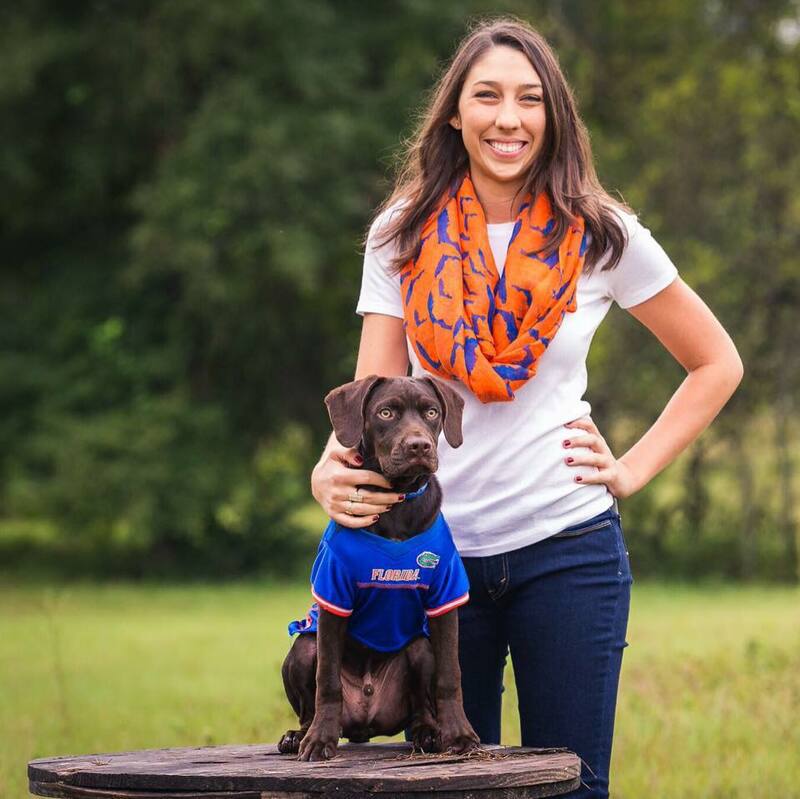 Gabi came to Gainesville from a sleepy Florida beach town for school, and she’s been working at the Straughn Center since she graduated. Gabi and her pup, Gunner. Kevin: What do you love about Gainesville? Gabi: I enjoy being outside any chance I get. My pup and I frequent Possum Creek Dog Park, Loblolly Woods, and Swamp Head Brewery. There is so much to do here! I’ve been here for 7 years and I still haven’t made it to all the restaurants I want to try! Gabi: This is TOUGH. There are so many places for good food and cocktails. I’m a big fan of Blue Gill and The Top — I can’t decide! Gabi reported that La Chua Trail is Gainesville’s best-kept secret. Gabi: I can’t believe people live here and have never been!! Kevin: How did you get involved with ACEL? Gabi: I joined ACEL last summer because I was looking to meet other young professionals in the area. I got involved with the Community Service Committee. We meet the second Tuesday of every month at 6:00 PM! Kevin: What advice would you give to young professionals in Gainesville? Gabi: Find a cause or an organization that you are interested in and get involved! You’ll be making a positive impact on the community as you meet other like-minded individuals.